On April 14, 1927, the first Volvo car drove out through the factory gate in Gothenburg, Sweden. The OV4 open-top car was powered by a 28-hp four-cylinder engine. While Volvo celebrates the 90th anniversary of the arrival of its first model this month, the company's story actually started in August 1924 because of a shared love of crayfish, according to the company archives. Gustaf Larson was lured into the Sturehof seafood restaurant in Stockholm when he saw it had fresh crayfish on the menu. Once inside he saw a familiar face. His friend, Assar Gabrielsson, was also there to try the crayfish. Gabrielsson and Larson were former colleagues at Swedish ball bearing company SKF. During the meal, their discussion turned toward cars. At that time, nearly 15,000 cars a year were being imported into Sweden. Most of them were coming from the United States. The men asked themselves: Couldn't Sweden produce its own cars? A month later design work on their Swedish car started. The name Volvo, which is Latin for "I roll," was first registered in 1915 for a product produced by SKF. That product was discontinued and the name remained dormant until 1926 when it was assigned to Larson and Gabrielsson's car project. 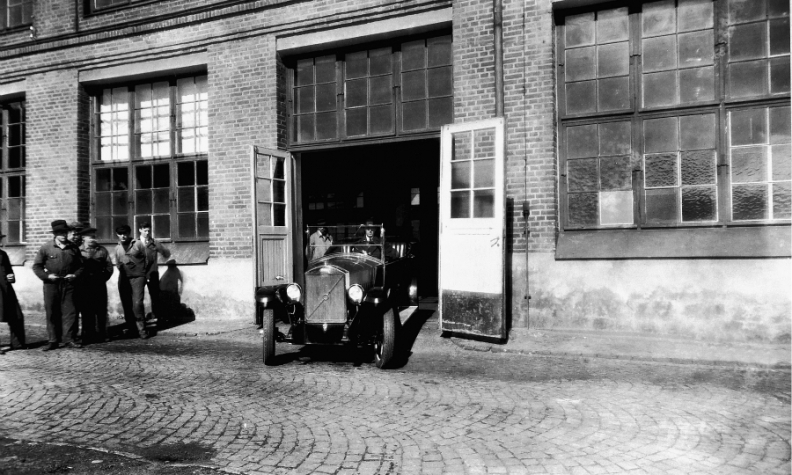 On the morning of April 14, 1927, the first Volvo car drove out through the factory gate in Gothenburg on Sweden’s west coast. The open-top car with a 28-hp four-cylinder engine was called the OV4. OV was an abbreviation for open vehicle. The body was built on an ash and beech frame, covered with sheet metal and was only available in one color combination: dark blue with black fenders. Volvo made 275 OV4s between 1927 and 1929. 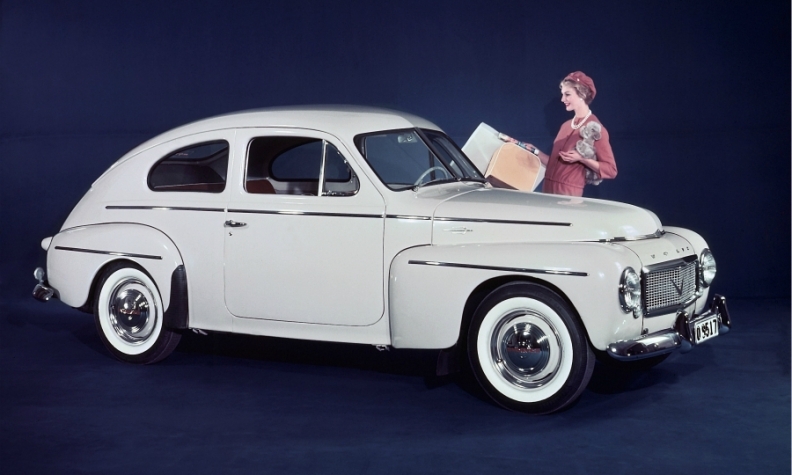 Volvo planned to make 8,000 units of the PV444 but enormous demand pushed output to almost 200,000. The PV444 also was Volvo's debut model in the U.S.
On September 1, 1944, the car that would make Volvo an international company, the PV444, was presented at an exhibition in Stockholm. 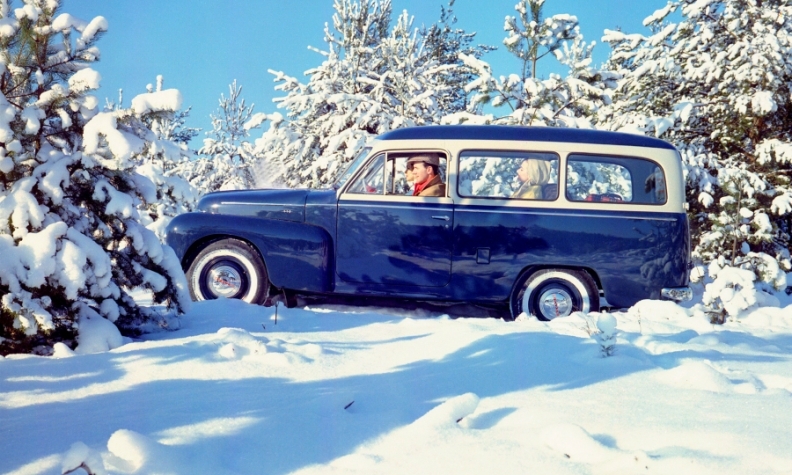 "The little Volvo," as it was called, was seen in Sweden as a promise of post-World War II prosperity. In the course of two weeks 2,300 people placed orders for the PV444, which cost 4,800 Swedish crowns, the same price Volvo charged for its first car, the OV4, in 1927. The PV444 was also Volvo's debut model in the United States. The first one was unloaded at the port in Long Beach, California, in August 1955. Skeptics thought Volvo would be a flop but by 1957 it was the second-largest import brand in California, according to the company's archives. By 1974 the U.S. was Volvo's biggest global market. The Duett was the first station wagon for Volvo. The automaker has produced more than 6 million wagons during the last 90 years. In 1953, the Volvo Duett launched under the slogan "two cars in one" because it was supposed to meet its owner's needs whether it was used for work or play. The Duett was the first in a long line of station wagons for Volvo, which has become firmly linked to the practical body style after producing more than 6 million wagons during the last 90 years. When the Duett was discontinued in 1969, the Volvo model range included another wagon that would become a company classic, the Amazon, which was introduced in September 1956. 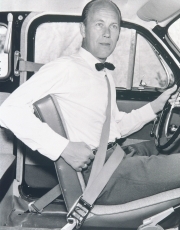 Developed by Volvo engineer Nils Bohlin, the 3-point seat belt is estimated to have saved more than 1 million lives since its debut. In 1959, Volvo's patented three-point seat belt became a standard feature in the Amazon, which was a world first. Developed by Volvo engineer Nils Bohlin, the three-point seat belt is estimated to have saved more than 1 million lives in the last 58 years. That number likely would be lower had Volvo not decided to waive its patent rights so that everyone could benefit from the legendary passive safety feature. 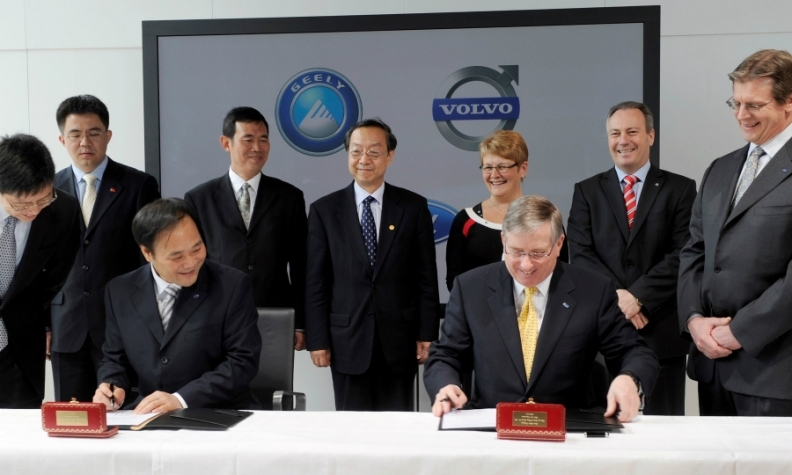 Chinese billionaire Li Shufu's Zhejiang Geely Holding purchased Volvo from Ford for $1.8 billion in 2010. Shufu (left) is with Ford Chief Financial Officer Lewis Booth. Volvo continued to play a leading role in vehicle safety in 1966 with the arrival of the 140 series. It was significant because it had front and rear disc brakes, a collapsible steering column and energy absorbing crumple zones in the front and back. In 1967, Volvo debuted its first rear-facing child seat. Nine years later, in 1976, Volvo's reputation for advanced safety was confirmed when the U.S. government bought 24 Volvo 240s for extensive crash testing. The result was that Volvo was officially chosen as the benchmark to set safety standards for all new cars. In 1991, the Volvo 850 debuted two world firsts to protect car occupants: its integrated SIPS (side-impact protection system) and an automatic height-adjustable safety belt mechanism. In 1999, Volvo Group sold Volvo Car Corp. to Ford Motor Co. for 50 billion Swedish crowns ($6.45 billion). Under Ford’s ownership Volvo introduced its first SUV. The XC90 debuted in 2002 and was a global success for the automaker. Within a few years it became Volvo's most important export product. 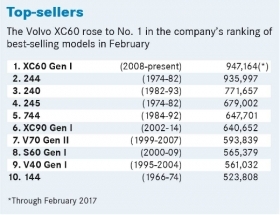 Volvo struggled during much of the first decade of the 21st century as Ford looked to turn its focus toward its namesake brand. In 2010, Chinese billionaire Li Shufu's Zhejiang Geely Holding purchased Volvo from Ford for $1.8 billion. Soon after that Volvo embarked on an $11 billion campaign to become a true alternative to Germany's dominant premium players. The money has gone toward two new vehicle architectures, a new engine range as well as two plants in China and a U.S. factory that is set to start production in 2018.